The 2013 introduction of EWB-USA’s impact assessment program of our international community programs served as an invitation to our members, staff and Board to play a part in our culture of learning. Learning about, and from, our impact has captured the interest of many of our members. This blog series will highlight those of you who contribute significantly to EWB-USA’s organizational learning. The 2015 Inaugural Closeout Impact Review Team. 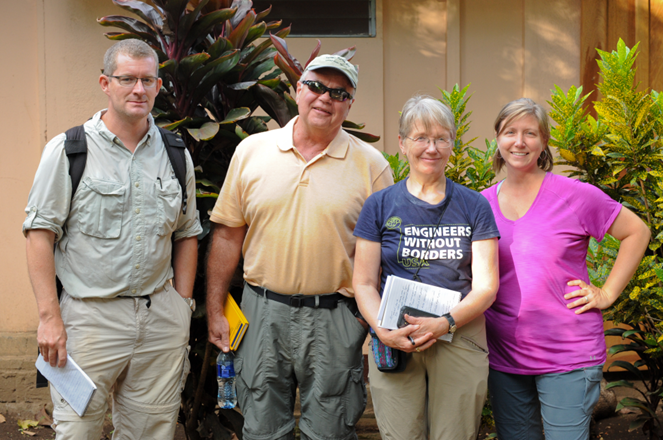 From left: David Lovell, Bruce Nieman, Claire Barker and Amanda Engle. This first closeout impact review involved the study of 14 projects in eight programs. A team of four exceptional members reviewed past reports on each project implemented and visited the project sites to conduct interviews with community stakeholders and local partners to learn about the changes they have experienced since project implementation. What has changed and for whom? How significant are those changes and are they lasting? What, if anything, did our work contribute to those changes? How can we adapt as a result of what we have learned? The team has contributed countless hours to 15 EWB-USA projects around the world. Their individual commitment to learning about how our programs impact the lives of our partners is immeasurable and they formed a “dream team” of project evaluators. Each member was selected specifically for the unique perspective they would bring to the impact study in Nicaragua. Claire Barker is an environmental professional retired from public service with extensive experience in Latin America, including the last three years in Honduras with the Boston Professional chapter. Her insight into the local culture and enthusiasm for capturing the community’s voice in our study was invaluable to ensuring that our learning was accurate. Amanda Engle was a founding member of the Central Ohio Professional chapter. Her experience as a professional mentor and particularly as a PMEL Lead was indispensable as we evaluated how well the PMEL requirements were providing learning opportunities to chapters and informative data on our organizational impact. David Lovell is a Faculty Advisor who also sits on EWB-USA’s Board of Directors and chairs the Southeast Regional Technical Advisory Committee. His keen interest in evaluating the current technical status of the projects reviewed will contribute substantially to the learning which will inform improvements to the project review process. Bruce Nieman is an active member of the Application Review Committee. His perspective as one of the gatekeepers of new international community programs being approved was vital to discussions about how to establish a strong propensity for sustainable projects in their earliest phases. Each of these members contributed thorough and thoughtful review of his or her community findings to develop a comprehensive learning report. Long hours were spent in Nicaragua drafting report sections and deciding how best to share their experience with our entire organization and the public. The finished product of the findings and recommendations is a successful example of collaboration to provide learning and actionable suggestions for improvement. Thank you, inaugural closeout impact review team, for your lasting commitment to increasing EWB-USA’s positive impact!